GM has announced a new low emissions package for the 2012 Chevy Volt, which will provide a few extra green benefits for Volt owners in California. Volts with the special add-on, which is now standard in California, will qualify for a $1,500 state rebate and will also get the added perk of being allowed to drive solo in the state’s carpool lanes. “The Volts with the Low Emissions Package are certain to be a strong draw for California commuters looking to travel the state’s notoriously congested freeways in the carpool lane,” said Chris Perry, vice president of Chevrolet Marketing. The $1,500 tax credit is part of California’s Clean Vehicle Rebate Project and is available for 2012 Volt owners and lessees. This is in addition to the $7,500 federal tax credit. The California Department of Motor Vehicles is making 40,000 Clean Air Stickers available for registered vehicles that meet the state’s emissions standards. The Clean Air Stickers allow drivers to use the carpool lanes, even if they do not have any other passengers riding with them. According to GM, commuters who use carpool lanes in Southern California save an estimated average 36 minutes a day, or about a third of their total driving time. Volts with the Low Emissions Package will start arriving at Chevy dealers in California by the end of the month. 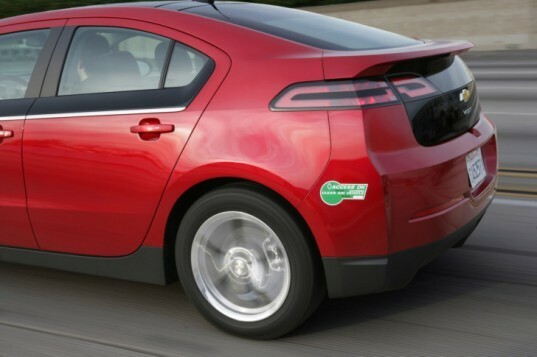 GM has announced a new low emissions package for the 2012 Chevy Volt, which will provide a few extra green benefits for Volt owners in California. Volts with the special add-on, which is now standard in California, will qualify for a $1,500 state rebate and will also get the added perk of being allowed to drive solo in the state's carpool lanes.